After a rapid erosion of RIM's BlackBerry US market share throughout 2011, new data indicates a stabilizing slowdown in RIM's losses as well as a tapering off of Android's growth, as Apple continued to be the only significant manufacture to experience growth in the quarter. Android appeared to be the primary beneficiary of RIM's US lost market share, which tumbled from just over 30 percent in January down to 16 percent in December, according to survey-based figures compiled by comScore. 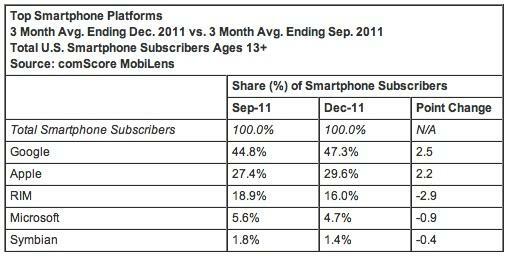 Over the same period, Android increased from a near tie with RIM at the beginning of the year to a 47 percent share at the end, essentially mirror image of RIM's decline. Apple steadily grew its share throughout the year, increasing from 25 percent to 30 percent over the year, as tracked by RBC analyst Mike Abramsky in the figure below. Across entire platforms, Comscore said Google's Android and Apple's iOS were the only smartphone platforms to gain share in the quarter, with Android gaining by 2.5 percent and Apple growing by 2.2 percent. RIM continued to fall by 2.9 percent for the fourth quarter, and Microsoft and Symbian remained stagnant, although Comscore's numbers suggest far greater market share for "Microsoft" than other firm's figures. 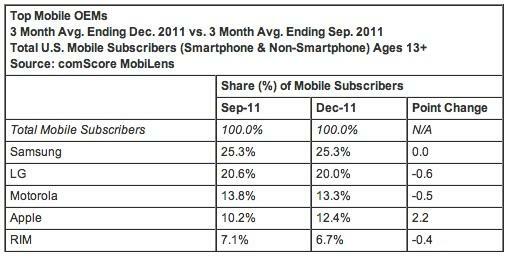 Comscore doesn't distinguish between Windows Mobile and Windows Phone 7, which has yet to gain any significant share in the US. Apple also the only maker among the top 5 US manufactures representing 70 percent of the US market to experience growth in the quarter. On a monthly scale, Abramsky noted that RIM's reported market share dropped from 16.6 percent in November to 16 percent in December, a deceleration of its losses. 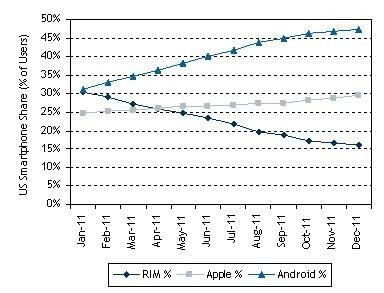 During the same month, Android grew by just 0.4 percent while Apple grew by 0.9 percent, more than twice as fast.